We are Orange County's premier full-service mobile crane rental company, offering affordable rates, a great selection of modern cranes, and experienced crane specialists. We opened our doors in 1983, and since then have successfully completed over 75,000 lifts. We have worked with tens of thousands of clients, from homeowners to contractors, and have built a thriving business based primarily upon return customers and referrals. Call us today to learn first-hand why our past clients in Orange County continue to choose Purple Crane year after year for all of their crane needs. 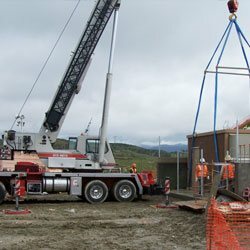 Purple Crane provides a broad range of lifting equipment: mobile hydraulic cranes, boom trucks, trucks, flatbeds, trailers, vans, and man baskets to assist you with your light- and heavy-duty lifts. Our fleet of truck-mounted cranes can handle loads from 3 to 75 tons, and lift them nearly 165 ft. All of our equipment is OSHA-compliant, reliable and carefully maintained to ensure optimal performance at all times. Call us today to reserve the equipment you need for your Orange County job. No time or money will be wasted when you call Purple Crane. 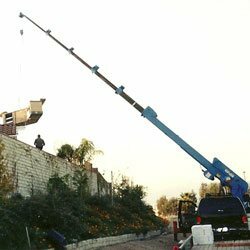 We will select the precise crane that you need to accomplish your lift, and you can expect us to arrive at your job within the timeframe promised. We'll carefully drive onto your jobsite, being careful to avoid overhead obstructions while expertly maneuvering around corners. We will then get your crane balanced, properly stabilized and assembled, so you can begin or continuing working immediately. Operating our high quality cranes is our team of highly trained and CCO-certified crane operators who all have between 9 and 40 years of experience. Whether you need a one-time lift or long-term rental, our superior crane services are always competitively priced. Call us today at (909) 622-0600 to reserve your mobile crane rental. We are standing by 24 hours a day, 7 days a week. The minimum time requirement for our rentals is 2 hours for light-duty cranes and 4 hours for heavy-duty cranes. If you require a long-term rental for your Orange County project, we can offer you a rental commitment for up to 2 months. 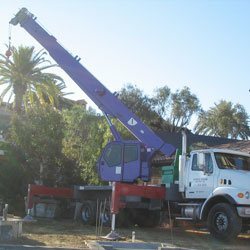 Purple Crane's expertise is offering heavy- and light-duty lifting services that cater to the needs of construction companies in Orange County. 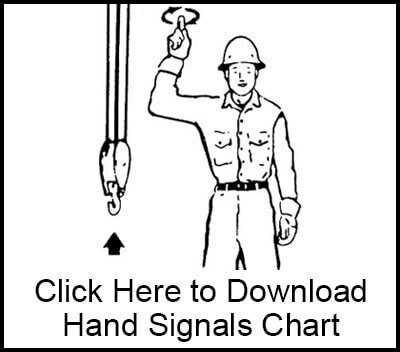 Our dedicated team knows how to communicate effectively with riggers in order to efficiently and safely move rebar, trusses, columns, beams, and more. We can move one or a few large items or move pallets of smaller items, such as cinder blocks, solar panels, lumber, and roofing materials. 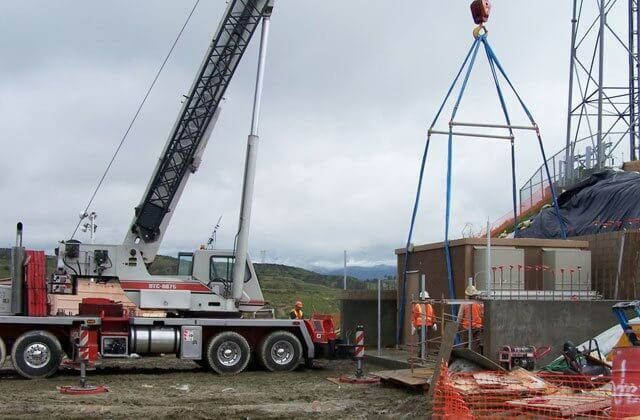 Our mobile cranes always arrive on time to job sites and can be set-up quickly, keeping downtime to a minimum. Our cranes can be used to offload trucks, stack heavy items together, or transport items to another worksite in Southern California. Call us today to reserve your high quality crane service in Orange County. Our crane experts will determine which of our cranes will serve your needs best. 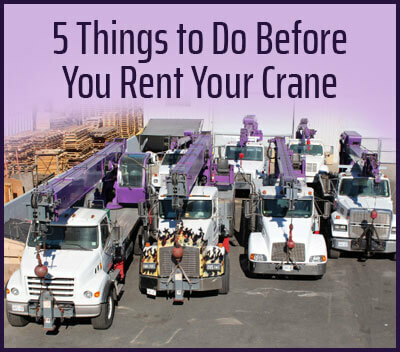 Purple Crane frequently performs lifts in Orange County for those in the utilities industry. Our crane operators are standing by, 24 hours a day, with a fleet of mobile cranes, boom trucks, trucks, trailers, and man baskets ready to be dispatched out to your place of business or job in Orange County. We can help with dropping large pipes into place, lifting water tanks, removing transformers, and installing light poles. We've also helped transport oversized items such as street lights, generators, transformers, and utility vaults. 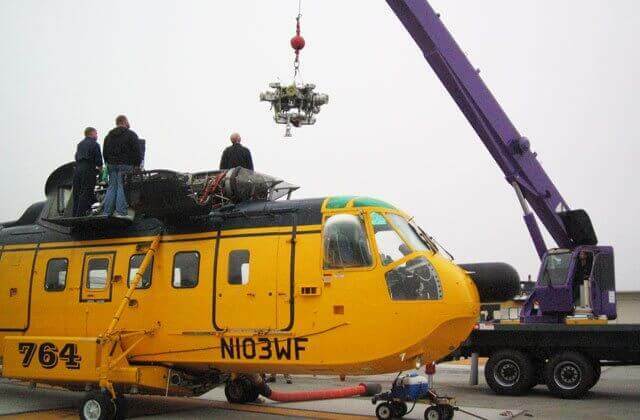 Plus, we can provide a crane or boom truck with a one- or two-person man basket for any service job. One of the most common requests we receive from the Orange County area is for assistance with the moving of a single large item for a residential or commercial customer. From air conditioning units to hot tubs to gazebos, Purple Crane has moved it all. Our drivers can pick up and transport the item from a warehouse or storage facility, and have a crane waiting at the Orange County home or office ready to lift the object. 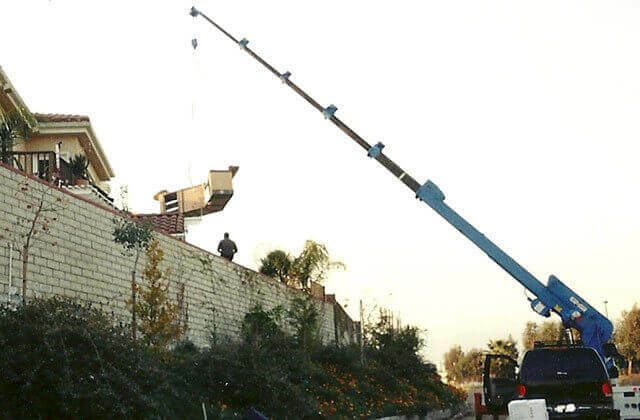 We have cranes that can lift these kinds of remodeling items over other homes, and place them carefully in side yards, in backyards, or on rooftops. In our 30 years of experience, we have moved sculptures, barbecues, barbecue islands, Jacuzzis, gazebos, swim spas, large appliances, and more. Past clients include owners of homes, apartment complexes, golf courses, estates, hotels, parks, and country clubs. 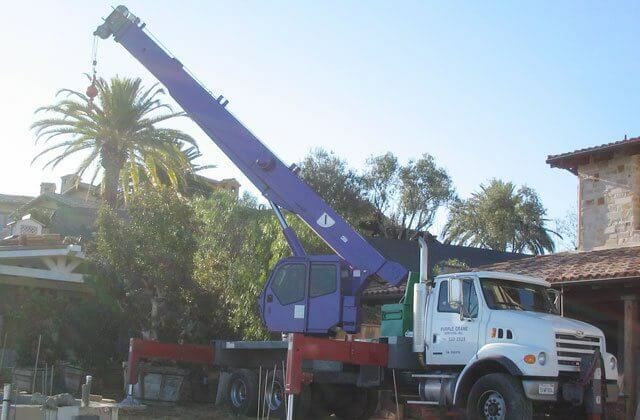 Purple Crane provides affordable mobile crane services to landscapers in Orange County. We have the expertise and experience to identify the best crane for any landscaping project. 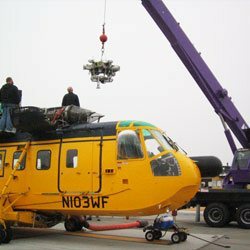 We frequently lift and move large sized and heavy objects, such as fountains, boulders, trees and rocks, or attach a man basket to one of our cranes for tree-trimming. Purple Crane is Orange County contractor's best choice for lifting shipping crates, freight containers, and other storage units. We will use heavy-duty trucks and trailers to safely relocate your shipping containers to another place on your work site or anywhere in Southern California. We can even arrange to have a crane ready to lift and place it at its final destination. Our professionals will ask you all the right questions in order to accurately determine the best crane and/or trailer for your needs. Call us today for all of your crane-related needs in Orange County. We offer emergency and round-the-clock services to meet the needs of our customers. We are trained to meet the lifting needs of just about every industry in Orange County: transportation, manufacturing, construction, heating ventilation and air conditioning (HVAC), landscaping, medical, printing, etc. We offer affordable rates, a great selection of cranes, and expert drivers and operators. We welcome credit cards, cash and checks, and will open credit accounts for those who qualify. Purple Crane is a proud member of the Specialized Carriers & Rigging Association (SC&RA). We are also fully insured by the NationsBuilders Insurance Services, Inc. (NBIS), which is an insurance company that specializes in the construction and transport industry. We can usually obtain same-day certificates of insurance if you have a last minute or urgent crane lift.